I just had the opportunity to review the most recent release, Live In Kansas City from Nick Schnebelen and it's electrifying! 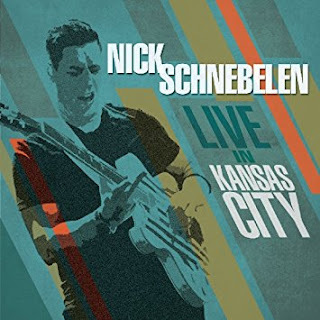 Opening with Fool, a super blues rocker, founding member of Trampled Under Foot, Nick Schnebelen affirms that he is a first rate vocalist and his riffs are fresh and crisp. Joined by Cliff Moore on bass and Adam Hagerman on drums, this band conjures visions of Edgar Winter's White Trash with it's raw, gritty temperament. Excellent opener. On Muddy Waters' Herbert Harper's Free Press News, Schnebelen cranks it up a few notches but maintains that New Orleans kind of funk with strong drive by Moore on bass. His guitar work is loose and free flowing with excellent phrasing and Hagerman lays out a cool drum solo as well. Very nice. You Call That Love has a really nice thumping bass line, solid vocals and extended guitar lead. What else could you ask from a contemporary blues track...really! Smoking slide work by Schnebelen and a Bo Diddley beat by Hagerman on Bad Woman Blues gives it great teeth. One of my favorite tracks on the release is Johnny Winter's Mean Town Blues. This is a great track and Schnebelen really works the Winter slide style with the fluidity of a world class player. On boogie track, Jonny Cheat, the band really gets a JLH/ZZT groove. Schnebelen rides high with power riffs giving the crowd at Knuckleheads Saloon a real show. Wrapping the release is Conformity Blues, a really nice jazz instrumental bringing to mind Duane Allman's jams with the early Allmans. This track has a rock bottom bass/drum line and Schnebelen really takes the guitar to the wood shed giving it an exceptional workout. This is a terrific closer to a realty strong live release.